This is week 18 and we still haven't finished any of the projects we started with. I was shocked but the CEO was happy to see what he suspected being highlighted in black and white. He loves the process. The number one project which we were awaiting our customer to approve was agreed to by them so it is a go but it turns out that this is really just the completion of one of the modules we have identified as a lower priority project. So we moved this project up to the number one slot and crossed out the customer name on the original project. Now that the meetings are running smoothly, we decided to bring in one project per week for a project review. The first victim will be the project that has been threatening to end for the last ten weeks so we can see what is going on with it. This week we encountered a problem within the interdependencies of one group of projects. Many projects were modules within a large platform. One of these projects was the foundation for this platform. Other modules relied on each other or were run more efficiently together. We decided to group them accordingly, place one project manager on top of this program and the other in charge of the next five projects outside this program. Looking at it this way allowed us to make more sensible decisions as to the priority of these modules. This week we were able to pull together a consolidated schedule for all the IT development projects and could take a first look at the resource loading. It didn't look too bad because we had linked the tasks in such a way that resources would not be overloaded. Of course, this meant that some projects were scheduled to finish later than we had hoped but, since they were lower priority projects, that's the right thing. Next week we'll start looking at status reporting on projects. I'm the first to admit that my lack of bandwidth has stalled the efforts of my team. I am only able to steal myself away from my current project for a couple of hours every Wednesday morning to meet with my team and then show up at the Steering Committee meeting every Friday morning. That means Mike and Sarah and left with all the heavy lifting. As a result, the consolidated project plan they put together for this week's meeting, that looked pretty sparse on Wednesday, did not meet our CEO's satisfaction by Friday. Frankly we all looked pretty bad. I promised we would have a better one in place by next week and that I would meet with one of our teams to show what we wanted to accomplish. That meeting was like pulling teeth. The team members were confused about what we were asking. Even though I had put the leader through my Cadence training a few years back, she couldn't seem to understand that by giving me hours of effort she still had to have a conversation with me to determine the durations. She was convinced that this was simply dependent on priority and didn't get that other tasks within her high priority projects and time spent on ongoing operations could affect these durations. Another leader in this group expressed the opinion that all Project Management is useless. One of the lower level guys said that they just do a bunch of work whenever and pay no attention to priorities. The other two lower level women just smiled and nodded. It is becoming clearer and clearer to me that we are doing some things backwards. We really needed to train the employees in the methodology before trying to plan these projects. As you may know, Bruce Fieggen, QPharma’s longtime VP of Project Management, has agreed to take the helm of QPharma’s Project Management Office in addition to his client-facing duties. The QPharma Project Management Office, or PMO, is responsible for prioritizing, scheduling, resourcing, and managing the many internal projects necessary for the ongoing operation of our Commercial Services division — most notably, the development of Python™ and our other Information Technology systems. It is crucial to the PMO’s success that all colleagues cooperate fully with PMO deadlines, resource requirements, requests for information, etc. — please accept my thanks, in advance, for your active participation in this process. Over the past several weeks, a Project Management Steering Committee has been formed, and we have been meeting regularly and going about the arduous process of identifying and prioritizing the dozens of projects that demand QPharma’s attention. In the coming weeks and months, please expect to hear from Bruce, his two Project Managers (Sarah Gerardo and Michael Gerace), and other members of the Steering Committee with various requests related to your role in helping this effort run smoothly. I look forward to keeping you informed as our important work progresses. Once again, thank you. No steering committee meeting this week so my team could focus on getting the Master Gantt chart together. Let's hope they pull it off to the CEO's satisfaction. I am still too busy on my current project and putting together proposals for two new projects to be much help. I'll see what they come up with on Wednesday and give them some advice. During my weekly PMO meeting I apologized to my team for allowing them to be criticized by the CEO for not being prepared. I promised I would stick up for them in the steering committee meeting. During the first part of the steering committee meeting I spent the first few minutes insisting that the chain of command be followed and that nobody criticizes my people but me. It was tense but my CEO trusts me. I reminded him of what I told him during my interview when he asked: "What am I going to find out about you two weeks after I hire you that I wish I knew now?" I told him: "I'm blunt." And I've proved that to be right many times since. After the dust had settled we got back to the agenda with one added item. Our big software program: Rock Python, had many elements that people wanted prioritized. On opening this file up, we saw that some of the projects were actually sub-projects of others. But the people were not showing how many resources were needed on a weekly basis because they didn't understand how the system worked. I was very frustrated. Once again we looked for completed projects and once again, none quite got there. I reminded the steering committee that these projects were supposed to last 2 - 4 weeks and many should have completed by now. We all agreed that this system was really highlighting this deficiency. The CEO asked for something out of the ordinary. Could he please pull the non-IT projects out of the list and make them their own separate list. I told him this was OK as long as they did not require resources from the other projects. He agreed and pulled about 12 projects out of the main list. We re-prioritized these and moved to resourcing. The rest of the steering committee was getting frustrated at trying to figure out how many hours people would need to spend over how much time. (Duration vs. Level of Effort) So the CEO asked for another new thing. 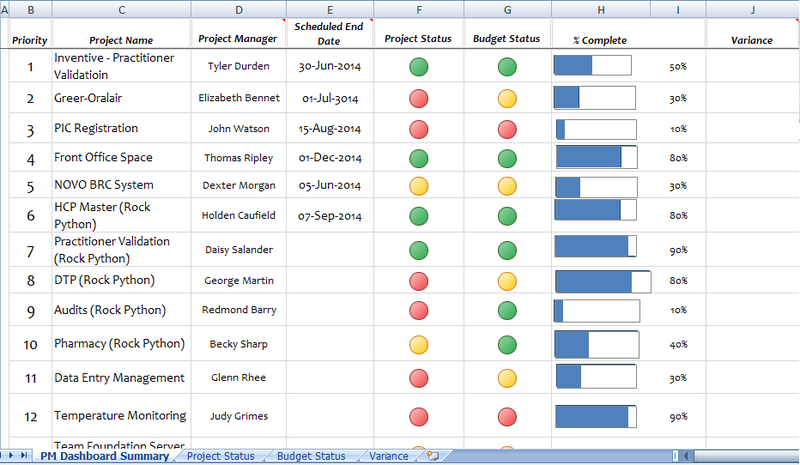 Could we place all the IT projects on one Gantt chart and track level of effort there? I was dubious but, since the Excel sheet wasn't working, I decided to give it a try. He asked how you do this. I showed him one of my projects' Gantt charts showing how I break out Work from Duration and allow MS-Project to calculate % of resources required per task. I showed how this allowed one to see the resource graph and highlight where resources were scarce. He was excited and asked that my team create this master Gantt chart. I asked for two weeks for them to perform this work. We argued back and forth but I got my team two weeks. Let's hope they pull it off. The CEO promised to do the same job by himself for teh non-IT projects over the weekend. With my wife undergoing a medical procedure and the CEO in California, I thought it was safe to cancel the steering committee meeting this week. Unfortunately, I was wrong. Shortly after the CEO got the cancellation message, he reinstated the meeting and took the red-eye back to New Jersey. He pulled my team into the meeting totally unprepared and criticized them for not having their charters and project plans ready. The word from above was, "Nobody cancels the steering committee meetings." Well, at least he has bought totally into the Proejct Management approach. I apologized to my people for getting them in trouble and vowed I would stick up for them next week. We agreed to get all the charters written by next Friday. With excerpts from my Project Management Novel, I will illustrate the many processes of the PMBOK. Here is the forty-second and last one: Close Procurements. Use this map to see how this process fits into the scheme of processes. “Why is it any different this time, Gwilym?” asked Fred. “What debt do we owe, Fred?” asked Gwilym. “Tha will have to ask Merlin on that.” Fred replied. This week our Wednesday PMO meeting was another quick one. I hate to waste the time of my team. We talked about our progress against the plan. We are doing the work we had planned but quite a bit slower than we had originally planned. But we were making progress and were ready to share some of this progress with the steering committee on Friday. During the steering committee we reprioritized some of our projects, added a new high-priority one, discussed the various change control systems and showed off our templates for status reports and project dashboard. 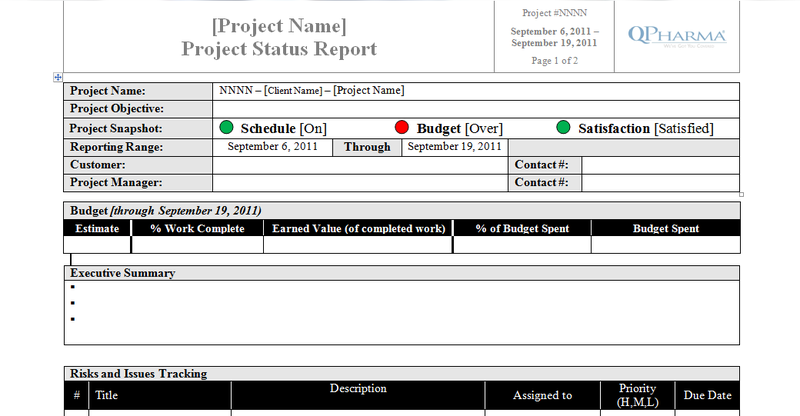 We liked the status report template but made a few changes to make it specific to the PMO Commercial Projects. It was based on our old Professional Services Report. Add it as a tab to our prioritization sheet so we can have the first column automatically populated in the correct order. Link the projects to their actual status report so we can get details rather than just the tab that has to be populated by the PMs . The big things were the staffing of resources against prioritized projects and change control. These generated a lot of discussion and I'd like to give you the benefit of our brainpower. We added resources to the columns we had in place before the meeting, figured out what % of time each resource was working on ongoing operations and started adding how much time they should be spending working on each project. We found out that we didn't have enough information so we asked the team to take it back to their offices after the meeting and fill it out for each person. We also found it useful to add a column that determined how many hours of work we should expect this week per project based on the percentages quoted to the right. This gave us a good reality check. Track-it were requests for IT support that people could assign resources to for things like fixing people's computers, but this also generated new project requests. Quality Change control for our ongoing operations, especially when they resulted in changes to customer or regulatory requirements. Professional Services Project Change Notices. These are used when our consultants are working under one statement of Work and our customer asks us to do something additional. We track these under PCNs to ensure we get paid for the extra work when the project is over. Project Change Control. This is what we were instituting to deal with changes to these internal projects on our Commercial Services side of the house. Since Professional Services don't steal resources from a limited pool, we have always kept this side of the house separate from the PMO. The PMO is all about prioritizing projects within the limited resource pool and investment dollars the Commercial Services side operates under. When Professional Services gets a new project, they hire more people and each hour spent on the project generates profit because it is consulting. When Commercial Services gets a new project, the limited resources get more work to do and we have to spend as little of the money we have as possible with a hope to generate earnings when the project is complete. So the PCN system wasn't going to work for the PMO. The Track-it system needed to operate outside the PMO to fix IT bugs but, when a new project was generated, that project would need to be approved and prioritized within the steering committee. People's time spent on dealing with IT tickets would have to be taken from the time they have available to work on ongoing operations. The Quality Change Control System, similarly, would operate in parallel, occasionally generating projects which would appear in front of the steering committee. The meeting was a success that ended in 90 minutes. Most of the team was there. I was only missing Medical and part of Operations. Sarah had pasted the latest Priority List on the walls with numbered Post-its next to each project title ready to be moved. We cancelled a couple of projects that were not really projects, just deliverables within other projects. Then our CEO asked us to add a couple of projects that stemmed from new customer orders. We figured out the priority of these by holding the post-it next to the top projects and asking: "Is this more important than this one...this one...etc." Then we looked over the list and decided that a couple of projects needed their priorities adjusted. But not as many as I expected. I'm used to more fluidity at this early stage. Mike showed off our Change Control System. We made some suggestions for improving it and he took notes. Sarah showed off the resourcing spreadsheet. This is almost ready to go. Sarah will update this with a few changes and send it out to the team to fill out for all their people. I completed the Executive Briefing and everyone felt like the time was well spent. New Product Development: We invest money in the hopes that some customer will buy the product or service when we're done. Customer Order: Some customer has promised to buy the product or service when it's finished and may even be paying for the development. Process Improvement: Invest to improve the current processes, reducing cost and increasing profits that way. Regulatory Mandate: Make this investment because we're told to by some regulatory agency. Do it or we cannot stay in a particular business. Facilities/Infrastructure: Invest in real estate, buildings or electronics to get into new or more business. Sarah wrote these on large flip-chart pages and pasted these on the walls of the room we were using. Then the steering committee arrived. I had representatives from IT, Marketing, Ops, IT QA, and QA. Finance was unavailable but we had a quorum. Once we had reached agreement on where each project fit in the categories, we prioritized within each. Armed with post-its bearing numbers from 1 - 20, I facilitated the team deciding which Process Improvement project was most important to company business. Lots of interesting discussions developed. "What constitutes company importance?" Was it time to complete, investment, number or types of resources, how many other projects are affected by this one? All mattered but, through discussion, we were able to achieve a forced ranking of every project within each category. Then the tough job arrived. We now had five #1 projects. We had to decide which of these five was most important to the future of the company. Once that was picked we had four #1 and one #2 to pick from. This continued until one category was exhausted and then we had only four to choose from. Lots more great discussions until all 45 projects were force ranked. Next up, we need to resource the top projects until we run out of resources. First project prioritization session is set for next Thursday and the following Monday I will conduct a four hour Executive Briefing for them. I'll keep you informed on progress. With excerpts from my Project Management Novel, I will illustrate the many processes of the PMBOK. Here is the forty-first one: Close Project or Phase. Use this map to see how this process fits into the scheme of processes. Then he and Fred returned to Avalon to see what was happening with the tower. On the way over, they talked about closing projects. “This project will be different from all the others we have closed in the past,” said Gwilym as they waited for the Avalon barge. They were being carefully watched by the four guards at the ferry stop. Gwilym knew all their names and the guards all knew that it was he, not Glastonbury, they were protecting from Palomides. “Why is that, Gwilym?” asked Fred. “Then that’s what we’ll focus on this time,” said Fred. We held the first steering committee meeting. This was designed to come to agreement about the rules of our committee, set up monthly meetings, a prioritization session and an executive training. The CEO finally got the point about other projects affecting his IT projects and was very pleased I had been pushing in this direction. The team agreed to all the proposed rules listed below and we will be holding regular meetings. Not just Python, all systems and desired systems. This is your opportunity to tell us what you want done, your absolute wish list. Bruce will be the point person, but I want to see a list by Tuesday noon. Regardless of how long you’ve been waiting, now is the time to tell us. Send the lists and a brief explanation to Emily and she’ll compile and send to the committee. Project: Defined as a temporary endeavor to provide a unique product service or result. All projects need a defined scope and an end date. For QPharma, this encompasses ALL projects, not just projects related to the Python system. Cross functional input into projects and priorities. New projects and priorities do not randomly derail existing priorities. The Steering Committee will prioritize and re-prioritize projects. The Steering Committee should authorize all projects. The committee should prioritize and re-prioritize all projects and will be published to the company. Re-prioritization of projects will be done on a monthly basis during PM Steering Committee meetings. In the cases of emergency changes/issues, an Emergency PM Steering Committee will be scheduled to discuss and decision-making on the issue. Fully resource all active projects. Approval of all deliverables. Business owners will need to approve all project milestone deliverables. Approval will be reflected in the Project Dashboard. The PM Steering Committee will meet on a monthly basis. The quorum requirement for the Steering Committee is 5 members. B. Fieggen will conduct an executive PMO training to the Steering Committee members. B. Fieggen will schedule the monthly PM Steering Committee Meeting. A list of all QPharma projects will need to be compiled 2 days prior to the PM Steering Committee Meeting for prioritization. This week we worked on more of the templates and Mike got the change control system working within SharePoint. I started choosing members of the steering committee. My preference was to have representation from all the functions of our organization. So I started with IT, Operations, Finance, Quality, Marketing and IT QA. I immediately received resistance from the CEO who wanted a small team. He saw no reason to include anyone other than IT and IT QA. He isn't understanding that projects from other areas are taking resources away from the IT projects he cares so much about. But he trusts me and is willing to give it a try in the first meeting. Projects can be authorized outside the steering committee meetings by approval of a majority of members – or just by PDB. Project Managers will use Earned Value calculations to report on budget – commercial projects will use hours rather than dollars to determine Earned Value. Project Managers will provide a weekly status report to the PMO every Wednesday – status reports should be updated weekly and available always on SharePoint. Now that we have a mission, it's time to determine how to put this into practice. I did a bit of research and found an excellent site that advises people on how to set up a PMO. Here it is: www.practicalpmo.com. Simon Wilkinson offers a free 7 steps guide and plugs his book. I may yet buy that book. Once again I distributed this chart to those who will be affected immediately by this work. I am not distributing it to the PMs outside the PMO until we have our processes in place. We want to be perceived as an asset to their efforts, not something else that starts with the same three letters. With excerpts from my Project Management Novel, I will illustrate the many processes of the PMBOK. Here is the fortieth one: Manage Stakeholder Expectations. Use this map to see how this process fits into the scheme of processes. Gwilym bowed and thanked King Lot, who asked if there was anything else. “That’s your job isn’t it?” replied the king, looking over the charter. “I will be happy to break the news to them but I have neither the authority to order them out nor the funds to recompense them for their losses. All the money comes from your treasuries to be deducted from the money you pay to King Arthur in …repayment for other goods and services he provides.” Gwilym had been about to say ‘taxes’ when he saw Lot and Morgause swelling in indignation. “What kind of problems? Do you suspect they would sabotage the works? I would have them flayed alive for interfering with any of my works!” thundered Lot. I typed this up and distributed it to my team and the company owner. No complaints so far! While I've been the head of Project Management at my company for the last 13 years, the owner has not wanted the 'bureaucracy' of a Project Management Office. I've busied myself with many other tasks in the meantime: Training our PMs, running projects and programs, planning customer projects etc. But last week the owner asked me to set up a PMO for the commercial operations portion of the business. He has a lot of IT projects that are either for internal purposes or for sale to our customers and he has recognized that the lack of discipline here is delaying these projects. He gave me almost carte blanche to set it up in the way I thought best. He told me I could be dictatorial in handing down rules in which we should operate. The downside is that the owner is very entrepreneurial and may chafe under these new rules so I expect a few fights in the future. Nonetheless, I am stepping forward to create this PMO from scratch. Seems like a perfect source for some interesting posts on how this works versus the plan. So here goes. Check in as I post on a weekly basis showing my strategies, tactics, successes and disappointments, challenges and triumphs. The first challenge will be getting these IT projects prioritized, fully resourced and completed on schedule. Wish me luck!